While I think it looks okay in pics, I am not sure its gonna fit me properly. I kinda tried to play with it (I haven't put grommets in yet) to test the fit. I think it is TOO straight, if that is possible for the venetian silohuette. It does not make a conical shape, but kinda a straight up and down. I am hoping that once I get all the boning into it (it needs to be ordered first) it will fit better. Maybe I'm just being pessimistic. Sigh. I've also found that its exceedingly hard to fit a corset to yourself when you have no one to help and no dummy...Here are my attempts so far. I apologize for the poor picture quality. Usually hubby is there to take good pics, but not tonight. 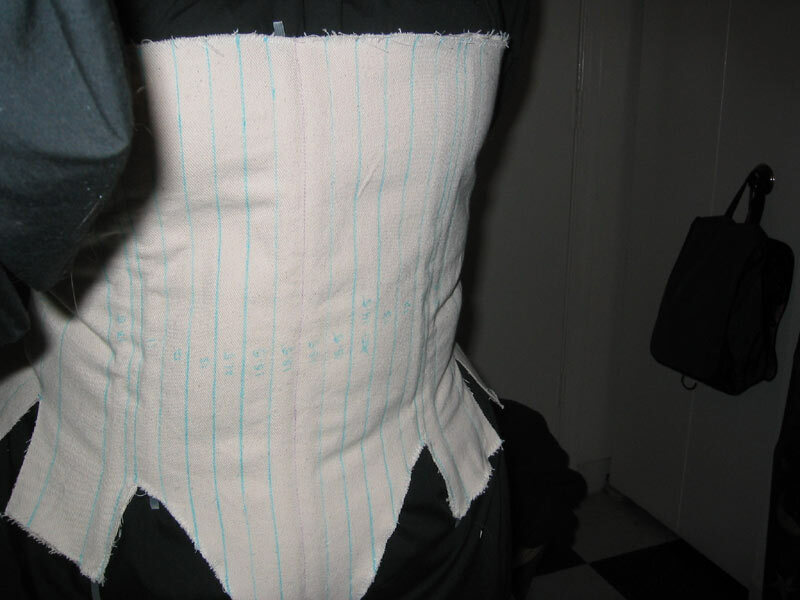 corset layout/boning--all the boning is straight up and down (except for the ones on the back) . Maybe this is the source of my "too straight" problem? Corset "fitting" . Keep in mind its not laced (no eyelets or grommets yet), and there are only a couple pieces of poly boning in there--i'm waiting to get my spiral steel boning, but I need to know what sizes to order first. So far I have only used the white denim for the corset. If I can get the pattern working okay I will cut out my outer brocady fabric, but as my supply of that is limited I am waiting until the corset pattern works to use up my decorative stuff. Yes, you hootchie, I was all over that title. I am down with you trying to emulate my greatness, at least you are not copying my engagement ring-snicker. Oh my intelligent friend, you did something I failed to do. FOLLOW the pattern. Even flaccid, I can tell your work is far superior. Your woes do not include blatant disregard for instructions nor results that lead you to use nouns like ape and sausage tube when describing your relationship with the product. I would say that is a success! I dunno how you were holding yourself in the picture, but it really looks right to me. Loved reading your progress on your project. 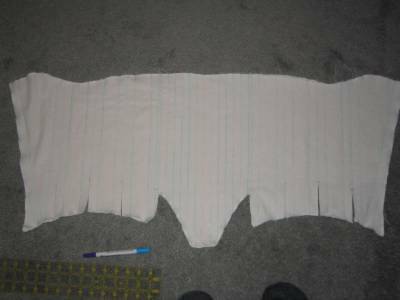 I'm so in a rut now with a shirt I'm making...anyway...if you're going to do the Simplicity pattern for your bodice, you must must must do some massive tweaking. I made one up a couple of years ago. You are definately going to need to lower the neck line on the bodice, in addition to ridding it of the curves. As drafted, it seems to hit most people at collar-bone level. You'll also want to raise the back, otherwise the straps will slowly slide off your shoulders. Every version of this dress that I've seen made up without alteration has had that issue. Good luck with your project, I look forward to seeing it finished!